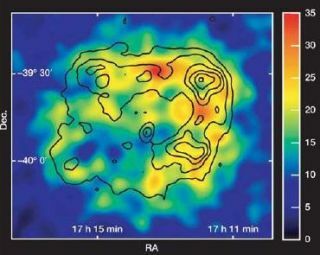 The gamma-ray image of supernova remnant RX J1713.7−3946. Astronomers have produced the first truly useful image ever of something in space using gamma rays. It's a picture only an astronomer could love, but it appears to help solve a century-long mystery. The image reveals a source of cosmic rays, the researchers said Wednesday. Cosmic rays are extremely energetic particles that continually bombard the Earth. Thousands of them passing through your body every day. Scientists don't know for sure where they come from, however, but the suspicion has been they're rooted in stellar explosions. The new image is of the remnants of an exploded star called a supernova. The production of gamma rays in this supernova shock wave tells researchers that it is acting like a giant particle accelerator in space, and thus a likely source of the cosmic rays in our galaxy. "This picture really is a big step forward for gamma-ray astronomy and the supernova remnant is a fascinating object," said Paula Chadwick of the University of Durham. "If you had gamma-ray eyes and were in the Southern Hemisphere, you could see a large, brightly glowing ring in the sky every night." Gamma rays are the most intense form of radiation known, roughly a billion times more energetic than the X-rays produced by a hospital X-ray machine. Since they pass right through just about everything, it's hard to capture them and make a picture, as is done with visible light and other forms of radiation. But gamma rays from objects in outer space are stopped by the atmosphere; when this happens, a faint flash of blue light is produced, lasting for a few billionths of a second. The astronomers used images of these flashes of light, called Cherenkov radiation, to make the new gamma ray image. The research is detailed in the Nov. 4 issue of the journal Nature. It was carried out using the High Energy Stereoscopic System (HESS), an array of four telescopes, in Namibia, South-West Africa. The study was led by David Berge at MPI fur Kernphysik in Heidelberg, Germany. One down, perhaps, yet one to go: Galactic cosmic rays are less energetic than the more mysterious ultra high-energy cosmic rays, where each tiny particle has as much energy as a speeding baseball.